The girls and I enjoyed an impromptu camping trip with grandma and grandpa. I'm beginning to think I prefer camping in the fall over camping during the summer. Mom gave me a bag full of mini pumpkins from her garden. Instantly I knew exactly how I would use them. This morning I gathered up a few items. After cutting the top piece to mimic the shape of the enamelware this is what it looks like placed inside. 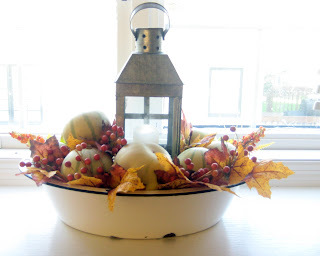 Next it was just a matter of placing the lantern and adding the pumpkins. To fill the spaces between pumpkins, I just tucked in the leaves and berries. Now my kitchen window as a little autumn farmhouse flare. I love it! I love the berries mixed in...I think I'm the only one who doesn't have a lantern! How clever... You are not just a pretty face...are you! LOL!! Love your centerpiece!! This is so cute! You have such a talent for this. I love it! 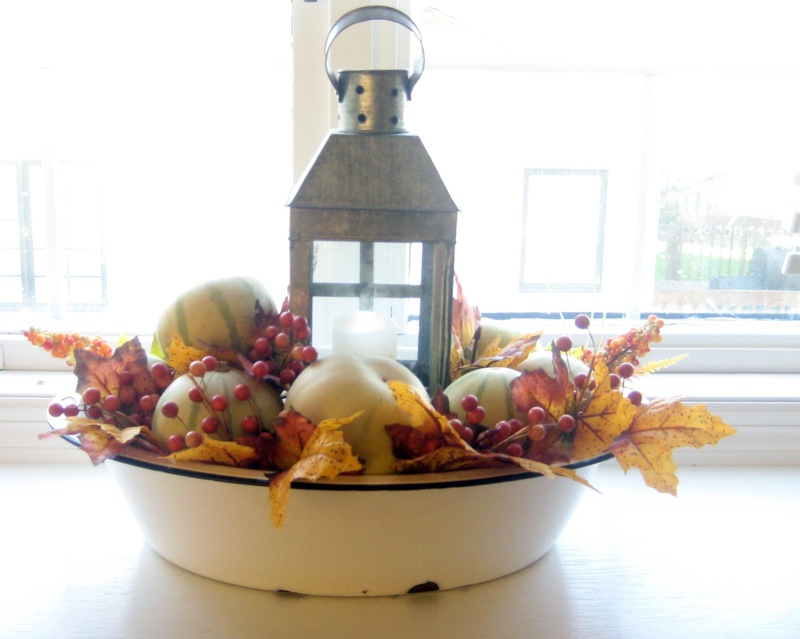 It is simple and creative and just perfect for the season!